The intensive and exciting hunt for planets around other stars ("exoplanets") is continuing with great success in both hemispheres. Today, an international team of astronomers from the Geneva Observatory and other research institutes  is announcing the discovery of no less than eleven new, planetary companions to solar-type stars, HD 8574, HD 28185, HD 50554, HD 74156, HD 80606, HD 82943, HD 106252, HD 141937, HD 178911B, HD 141937, among which two new multi-planet systems. The masses of these new objects range from slightly less than to about 10 times the mass of the planet Jupiter . The new detections are based on measured velocity changes of the stars , performed with the CORALIE spectrometer on the Swiss 1.2-metre Leonard Euler telescope at the ESO La Silla Observatory, as well as with instruments on telescopes at the Haute-Provence Observatory and on the Keck telescopes on Mauna Kea (Hawaii, USA). a giant planet moving in an orbit around its Sun-like central star that is very similar to the one of the Earth and whose potential satellites (in theory, at least) might be "habitable". At this moment, there are 63 know exoplanet candidates with minimum masses below 10 Jupiter masses, and 67 known objects with minimum masses below 17 Jupiter masses. The present team of astronomers has detected about half of these. The new results are the outcome of high-precision radial-velocity measurements. This fundamental observational method is based on the detection of changes in the velocity of the central star, due to the changing direction of the gravitational pull from an (unseen) exoplanet as it orbits the star. The evaluation of the measured velocity variations allows to deduce the planet's orbit, in particular the period and the distance from the star, as well as a minimum mass . 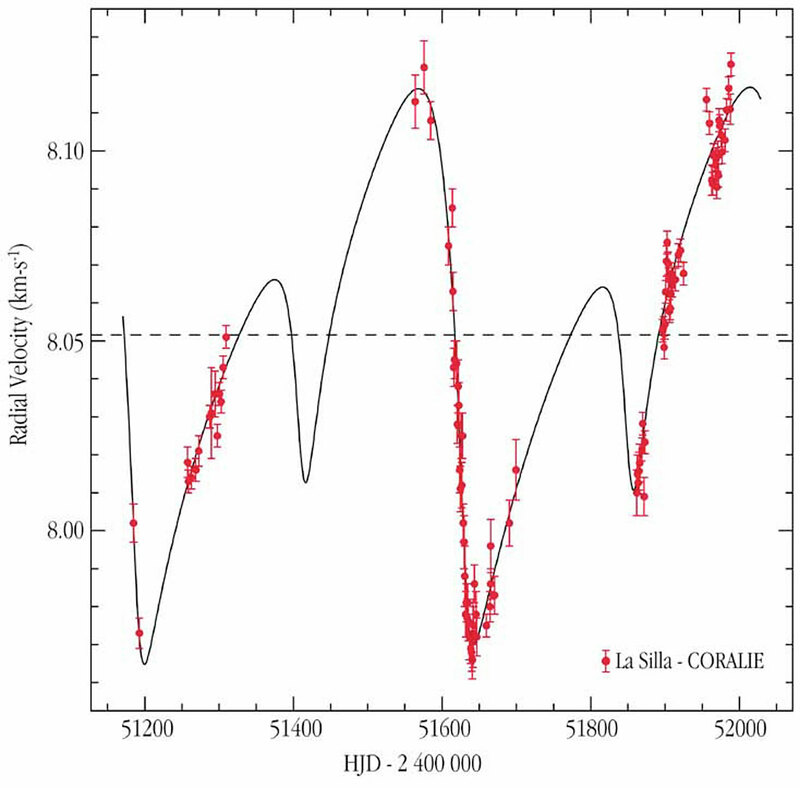 Four of the new planets were detected from La Silla and three ELODIE candidates were secured with CORALIE measurements. With the eleven new discoveries, the CORALIE/ELODIE programmes have contributed to the detection of about half (32) of the known (63) planetary candidates with minimum masses below 10 Jupiter masses, or 36 out of 67 known objects with minimum masses below 17 Jupiter masses . Among the present detections, there are two new planetary systems (HD 82943 and HD 74156), each with two planets. They bring to six the number of known multi-planet systems, four of which owe their detection to CORALIE/ELODIE measurements. This demonstrates the outstanding role that comparatively small telescopes can still play in modern astrophysics. Detailed information about all of the new planets are available on the dedicated web page at the Geneva Observatory web site. The detection of the outer planet that orbits the star HD 82943 was announced earlier (ESO Press Release eso0019), together with seven CORALIE planet candidates at other stars. 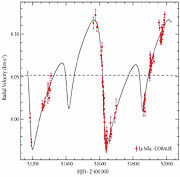 The follow-up observations at La Silla soon revealed a departure from the previously determined orbit. The accumulated measurements (ESO Press Photo eso0114) now allow the detection of a second, inner planet in this system. Its orbital period (221 days) is about half of that of the outer one (444 days). Future observations should confirm the 1:2 ratio between the periods; this indicates a "resonance" that may result from the gravitational interaction between the two planets. Similar orbital resonances are known in the solar system, especially in case of the minor planets (asteroids). With the exception of the planet iota Hor b (cf. eso9912), circular orbits among exoplanets have only been found for short-period systems, contrary to what is the case for the giant planets in our own Solar System. However, the orbit of the newly found planet near the sun-like star HD 28185 is very nearly circular and with a period of 385 days (close to 1 Earth year), its distance from the star, 150.6 million km, is almost equal to the distance betwen the Sun and the Earth (149.6 million km). This new planet is therefore located in the "habitable zone" where temperatures like those on the Earth are possible. Still, it is a giant, gaseous planet (with a minimum mass of 3.5 times that of Jupiter, or about 1000 times that of the Earth) and thus an unlikely place for the development of life. Nevertheless, it may be orbited by one or more moons on which a more bio-friendly environment has evolved. The presence of natural satellites ("moons") around giant extra-solar planets is not a far-fetched idea, just look at our own Solar System. A planet in an extremely elongated orbit around the star HD 80606 was found in the frame of the ELODIE/Keck collaboration. The measured, very large eccentricity (e = 0.93; ESO Press Photo eso0114) implies of factor of no less than 26 between the smallest and largest distance to the star. When the planet is closest to the star, it is only a few stellar radii away (about 5 million kilometres). Further progress within the current programme is expected soon, when the Very Large Telescope Interferometer (VLTI) at Paranal becomes available, cf. eso0106. This new instrument will have the observational capability of very high-accuracy positional measurements (astrometry) and thus be able to detect even very small wobbles of stellar positions in the sky that are due to the pull of orbiting planets. This will provide a crucial contribution to the determination of the true repartition of exoplanetary masses, a hotly debated question. Important advancement in our understanding of the formation of planetary systems is also expected with the advent of HARPS. This new high-resolution spectrograph, capable of reaching the extremely high radial-velocity precision of 1 m/sec, will be installed on the ESO 3.6-m telescope at La Silla at the end of 2002. HARPS will extend the domain of planets accessible with the radial-velocity technique towards significantly lower masses - down to about ten Earth masses on short-period orbits . It will also greatly improve our capability of detecting planets with longer periods and multi-planet systems. The mass units for the exoplanets used in this text are 1 Jupiter mass = 318 Earth masses. A fundamental limitation of the radial-velocity method, currently used by all planet-hunting research teams, is that because of the uncertainty of the inclination of the planetary orbit, it only allows to determine a lower mass limit for the planet. However, statistical considerations indicate that in most cases, the true mass will not be much higher than this value. Earlier accounts of this research programme have been published as ESO Press Release 18/98 and ESO Press Release 13/00. Views of the 1.2-metre Leonard Euler telescope and its dome at La Silla are available as PR Photos 13a-c/00. More information on these discoveries may be found in a Press Release from the Tel Aviv University and on the Geneva planet-search web page. Detailed information about all of the new planets are available on the dedicated web page at the Geneva Observatory web site: http://obswww.unige.ch/~udry/planet/new_planet.html.